Another product line that the S. W. Betz Company specializes in is different kinds of gantry and jib cranes. We distribute a wide range of standard and custom lifting solutions that assist in material handling for a number of different industrial businesses. Gantry and jib cranes come in a variety of sizes, shapes, and materials to fit any need that you might have. Some of the different types of gantry and jib cranes that we carry are listed below. We also provide custom solutions per customer request. Floor Mount Jib Cranes – These jib cranes are one of the most basic models that we offer. Capacities can reach up to 10,000 pounds, and clearance below the boom can reach up to 20 feet. Portable Jibs – These jibs are a light duty alternative to the floor mount jib cranes with one main exception: They are portable. This eliminates any need for site preparation and installation, and they can easily be transported by forklifts or lift trucks. Standard capacities reach 1,000 pounds and have a boom length over 12 feet. Full Cantilevered Wall Mount Jib Cranes – Ideal for maximum head room and have capacities of over 5,000 pounds. Overbraced Tie Rod Wall Mount Jib Cranes – Allows for 180 degree manual rotation with capacities up to 6,000 pounds. Telescoping Boom Wall Mount – Standard lengths of up to 16 feet and capacities up to 4,000 pounds. Pillar Mount Jib Cranes – Fastened between the floor and the ceiling and rotate on spherical bearings for easy movement. Capacities available up to 4,000 pounds and the beam can be anywhere from 8 to 20 feet. 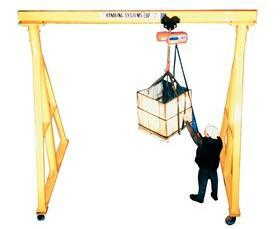 Portable Gantry Cranes – We carry both portable gantry fixed cranes, as well as portable gantry telescoping cranes. These cranes are on roller-bearing steel wheels for easy movement. Jib Lifts – Telescoping jib lifts and pallet lifts. These lifts convert your lift truck into a mobile crane, giving you the ability to pick up items that your forks cannot reach. Pallet Lifts – Use your crane to lift palletized loads. Bridge Cranes – With capacities of up to 60 tons, these overhead traveling cranes are designed to travel on runways supported by building frame members. The S. W. Betz Company distributes a wide variety of cranes and lifts for many of the top manufacturers in the industry including Vestil and Contrx Cranes. Contrx Cranes is located in Neenah, Wisconsin and has been manufacturing quality lifting solutions since 1977. If you are in need of or would like more information on any of our gantry and/or jib cranes, please contact us and one of our team members will be happy to assist you. For more information about Gantry & Jib Cranes or any other product or service from S.W. Betz, fill out and submit the form to the right.